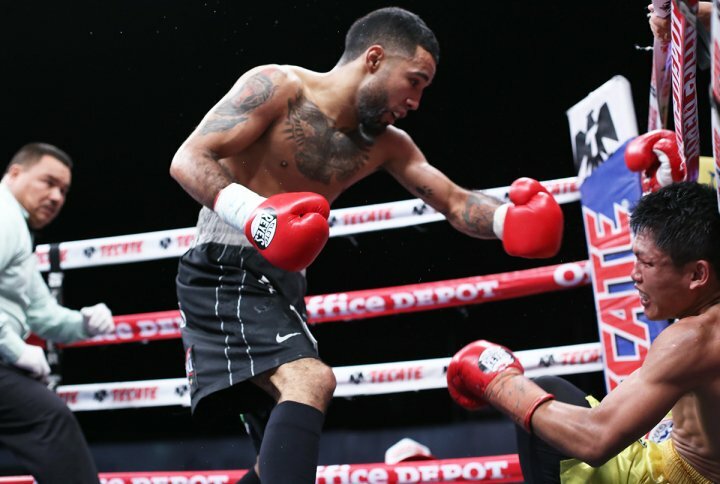 Bantamweight contender Luis Nery dropped Jason Canoy twice en route to a third-round knockout victory at the GasMart Stadium in his hometown of Tijuana, Mexico, on Saturday. The southpaw Nery dropped Canoy inside the first 30 seconds of the opening bell, a counter left hand putting the underdog flat on his back. Undaunted, Canoy bravely rose and continued to let his hands go. However, Nery (27-0, 21 knockouts) floored Canoy again with a barrage of punches midway through Round 3 and, this time, the writing was on the wall. Canoy got to his feet but was quickly trapped in a corner with Nery teeing off. The Filipino fighter was still attempting to fire back when referee Jesus Becerra inexplicably stopped the contest. The official time was 2:44. This fight was Nery’s first since being reinstated by the WBC following a suspension for failing to make weight for his Mar. 1 rematch with Shinsuke Yamanaka. Nery would knock Yamanaka out in two after weighing 121 pounds, three pounds above the bantamweight limit. Nery was also stripped of his WBC title. Nery’s win on Saturday night awarded him a regional title belt, which will likely mean a return to the WBC rankings. Canoy, who resides in Cebu City drops to 27-9-2, 19 KOs. In the co-feature, junior flyweight contender Kenia Enriquez, who also resides in Tijuana, won a one-sided 10-round decision over Venezuela’s Norleidys Glaterol. Scores were 100-89, 100-89, and 100-90 for Enriquez, who improves to 21-1, 9 KOs. Glaterol, who is 19 years of age, drops to 7-1, 7 KOs. Francisco A. Salazar has written for RingTV since September 2012. He can be reached by email at [email protected] or on Twitter at FSalazarBoxing.